Made in New England: Fire Cider Apple Cider Vinegar Tonic with African Bronze Honey, Natural Detox, Pure & Raw, Certified Organic Ingredients, Ideal for Cleansing Diet, No Heat Processed, 32 Shots, 16 oz. Fire Cider Apple Cider Vinegar Tonic with African Bronze Honey, Natural Detox, Pure & Raw, Certified Organic Ingredients, Ideal for Cleansing Diet, No Heat Processed, 32 Shots, 16 oz. 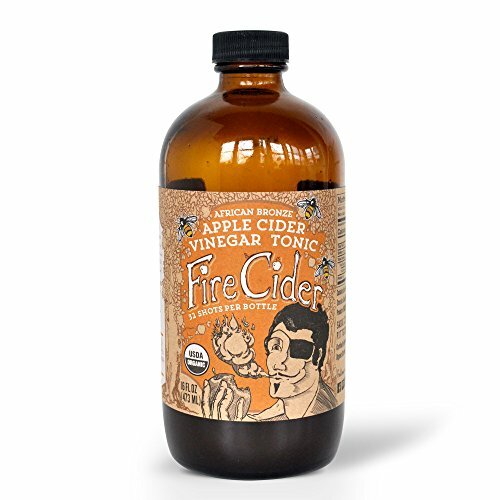 Fire Cider African Bronze is the latest addition to our lineup of health tonics! After crafting our usual base of organic raw apple cider vinegar, roots, veggies, fruits, and spices, we sweeten the pot with African Bronze Honey. This certified organic, raw, fairly traded multi-floral honey comes from Zambia, where beekeepers sustainably harvest the bark hives of wild forest bees. The honey is darker, micro-nutrient and antioxidant-rich, and gives our Fire Cider tonic a smooth texture and a flavor that has exotic hints of toffee, smoke, and spice. This honey with a mission is brought to North America by the good folks at the African Bronze Honey Project. Their work supports indigenous African beekeepers and grassroots organizations, while helping to preserve the pristine forest, people, and culture at the headwaters of the Zambezi River.